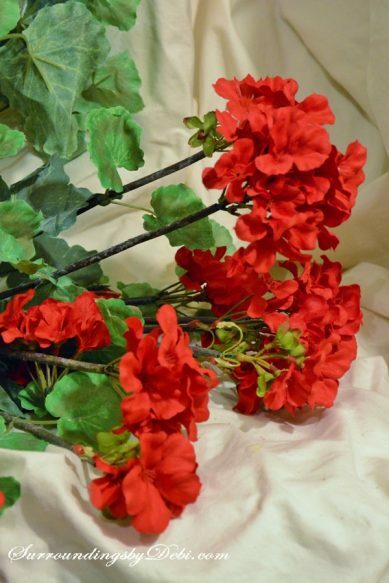 I just love the look of red geraniums in the summer. 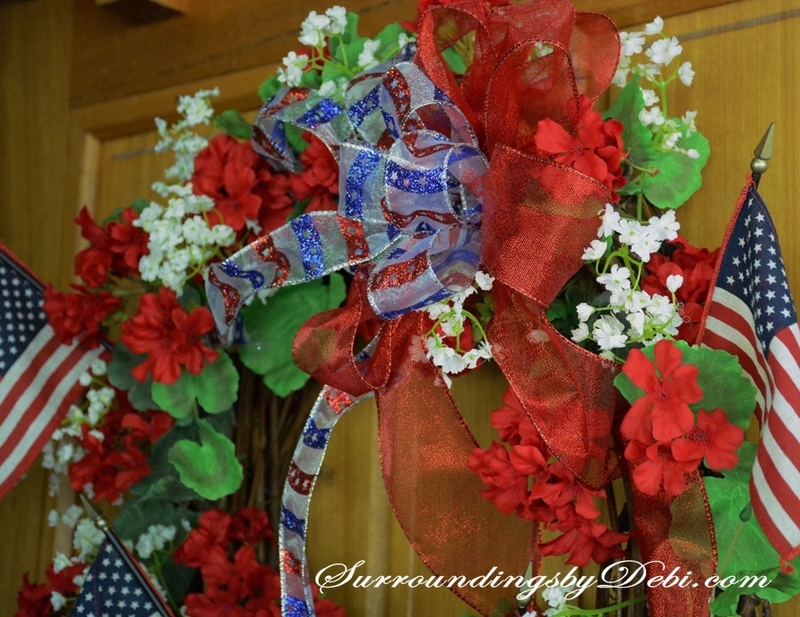 You might remember the red geranium wreath we used in the Patriotic Porch setting we created on my sister’s front porch. She had found it at a bargain price at a recent garage sale. 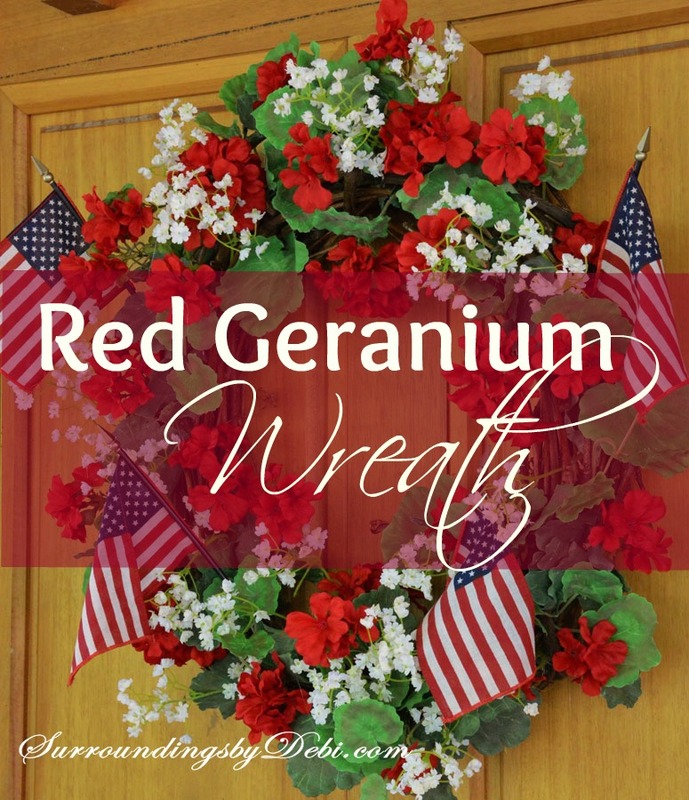 I loved the wreath – and wanted a red geranium wreath of my own. Maybe you do too. So let’s create one today. 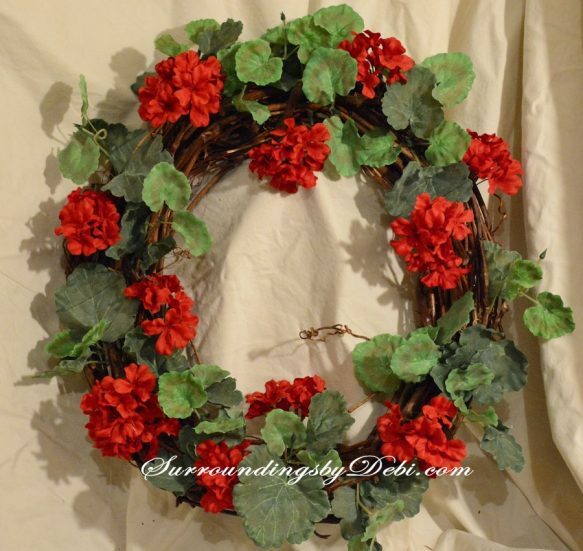 First we will begin with a grapevine wreath and 2 bushes of red geraniums. If you want a thicker wreath, simply use more geraniums. I already had the wreath from an old Christmas wreath I had torn apart and I purchased the geraniums from – you’ve got it – Joann Fabrics, one of my favorites. 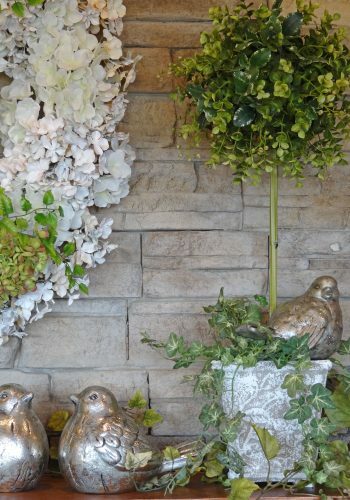 I found them at 66% off, making them only $2.49 a bush. 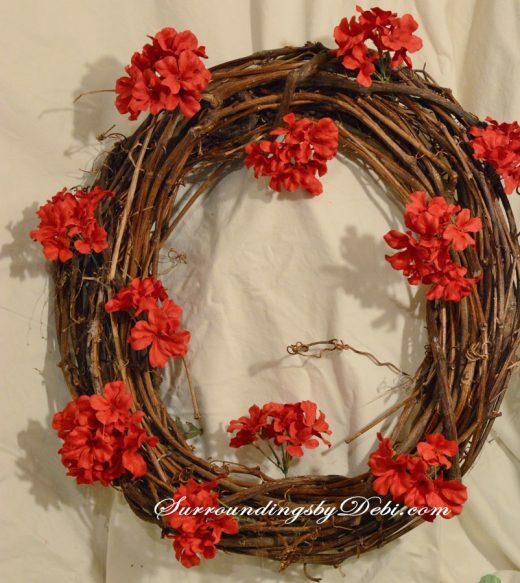 Total red geranium wreath price – Just $5.00 – I think that even beats my sister’s garage sale price! But, let’s not tell her. I began by cutting apart the bush and dividing the bushes into three piles – leaves – small blooms – large blooms. I cut each stem approximately 3 – 4 inches in length. Next I began with the pile of large red geranium blooms. 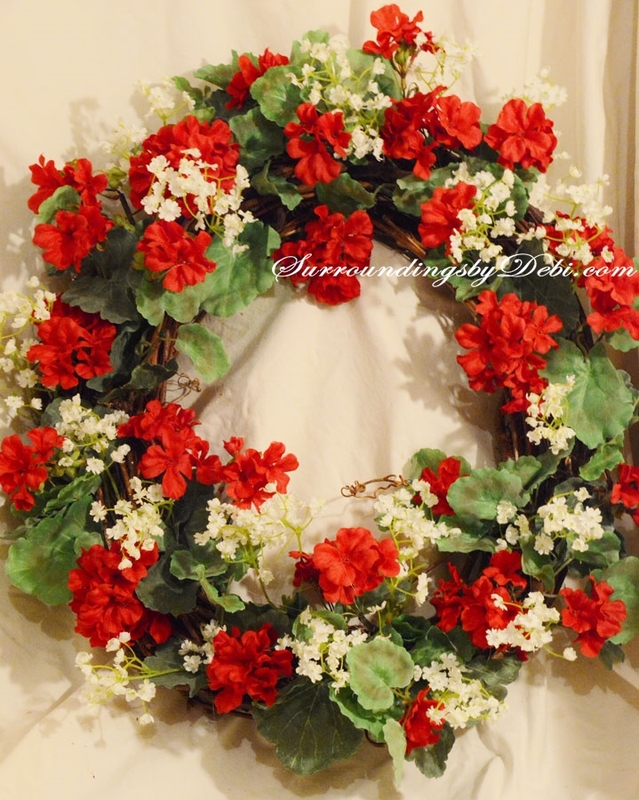 Dipping the end of the stems into a hot glue pan, (you could use a glue gun), I placed the blooms evenly around the wreath, inserting them into the grapevine. 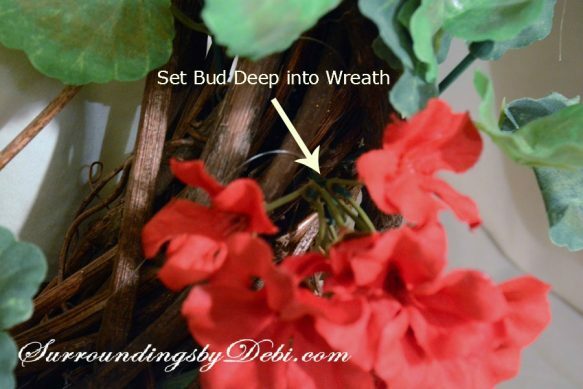 Once all of the large blooms had been placed, I took the green leaves from the bushes and inserted them evenly around the wreath amongst the larger geranium blooms, after dipping each stem into the glue. 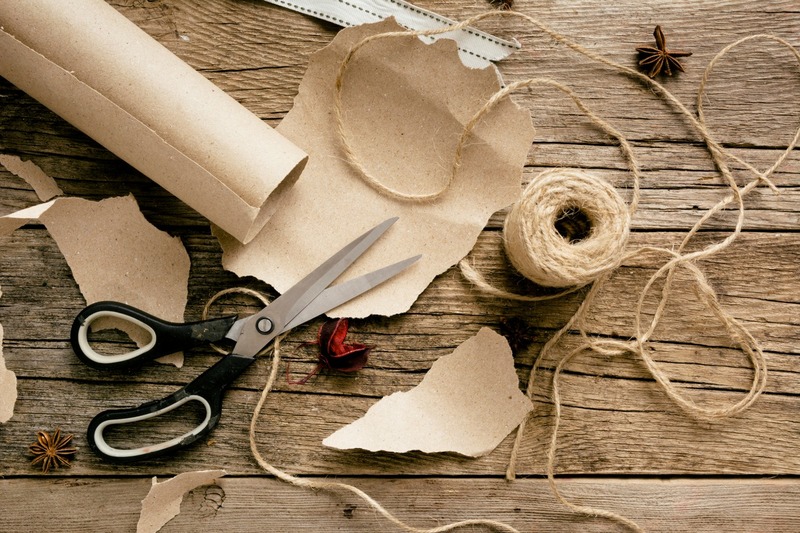 Please note – the glue will be very hot – work with glue very carefully. 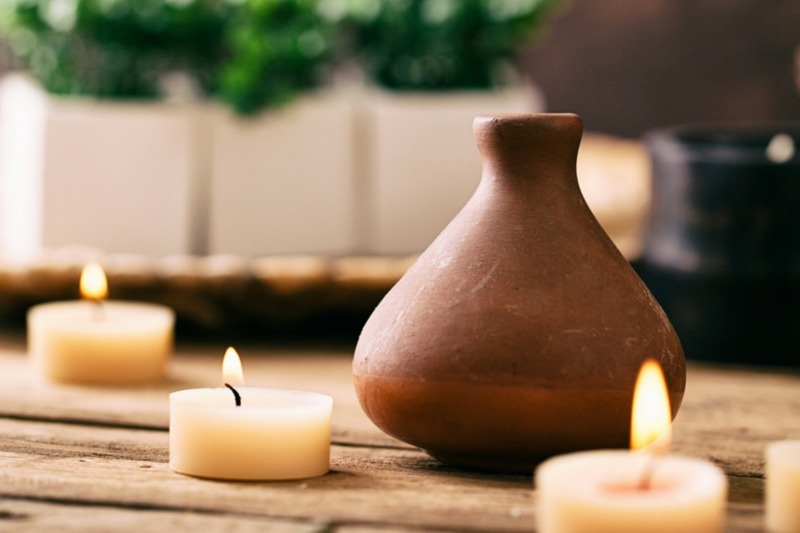 Do not heat the glue until it is thin – let it be a bit thick while you are working with it. Now I am betting you can guess the next step. That’s right. 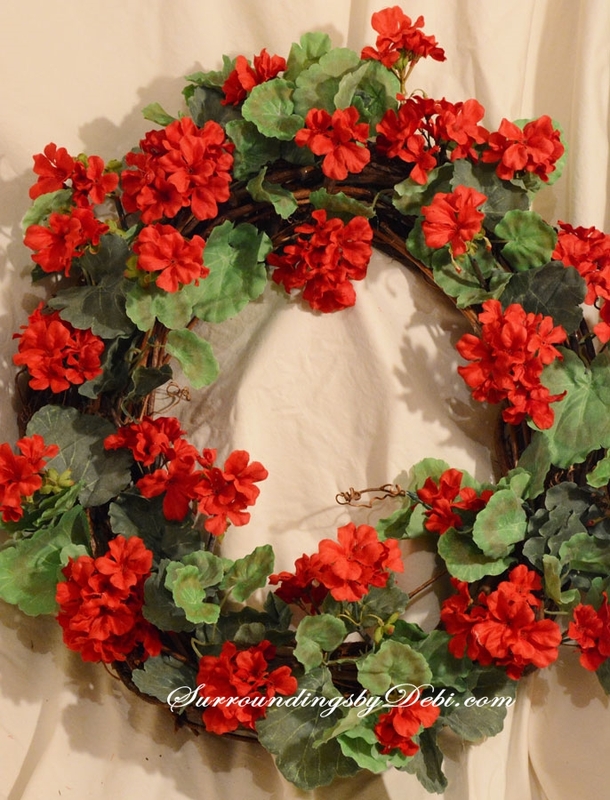 Dip the stems of the small red geranium blooms into the glue and begin to place the blooms evenly around the wreath. 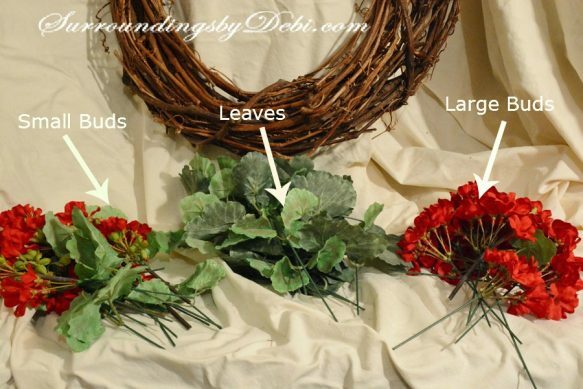 I left some of these stems a bit longer and worked them throughout the wreath to add a bit of dimension to the wreath. 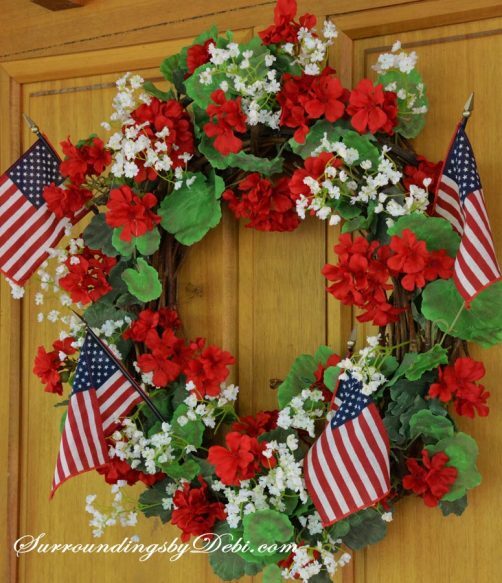 I loved the wreath just as it was and it looked just like the wreath my sister had purchased. I did, however, want to use it on my front door for the 4th of July and so I wanted to add a bit of additional color to tie into the holiday. I remembered I had a bit of the white garland I had used in my Iris Door Basket and decided to add some to this red geranium wreath. I just tucked a few pieces into the wreath – again evenly throughout the wreath. And I liked the look of it as well. 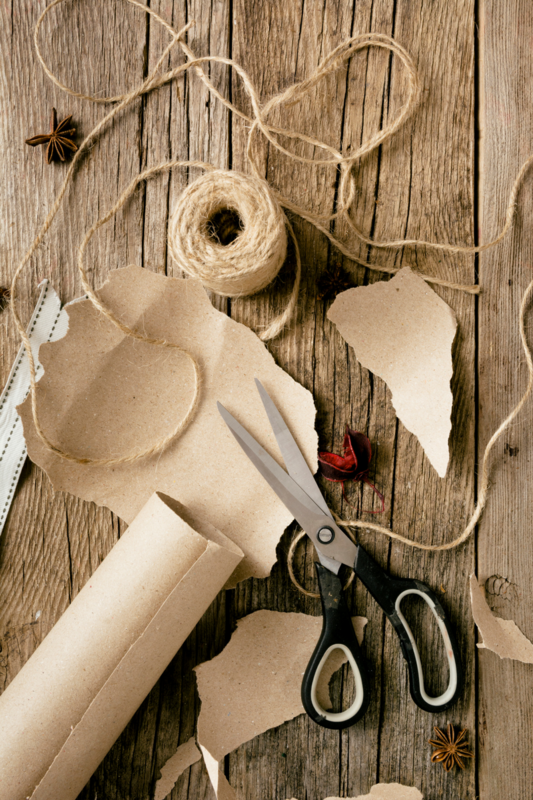 Quick tip – when using hot glue, you will have glue spider webs as you work. 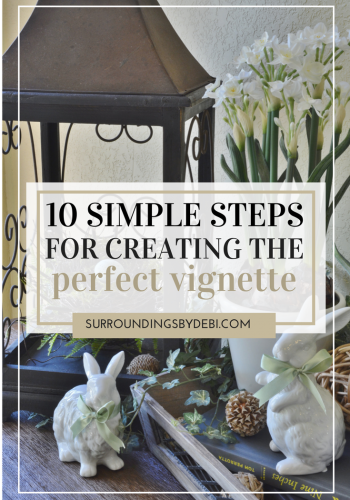 Simply take your blow dryer and run it over your completed wreath. Those webs will disappear! 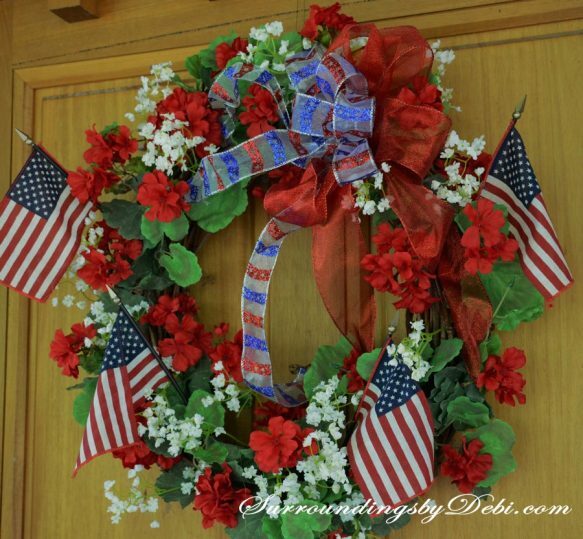 Once I had finished the wreath, I placed it on the door and tucked small flags in among the flowers – just for the holiday – I can easily remove them afterwards. 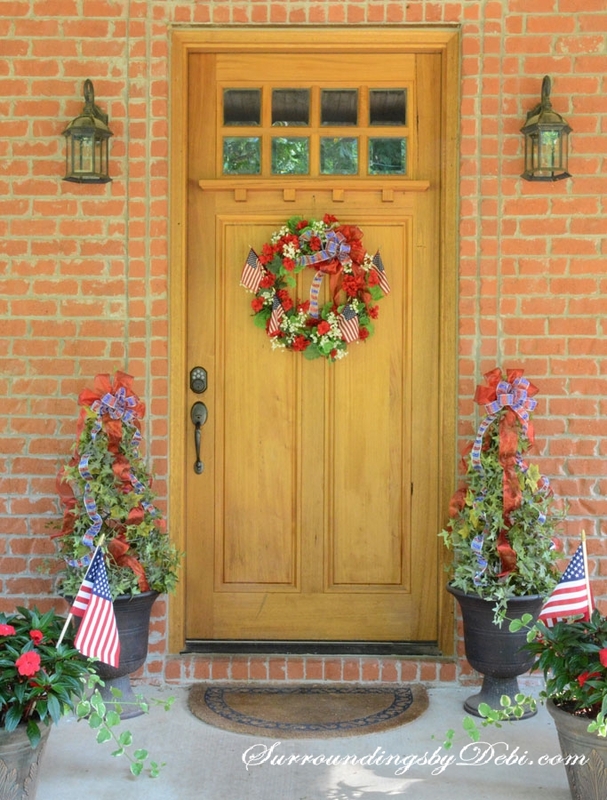 Our front door is protected. I didn’t even wire them in – just placed them securely deep within the wreath. 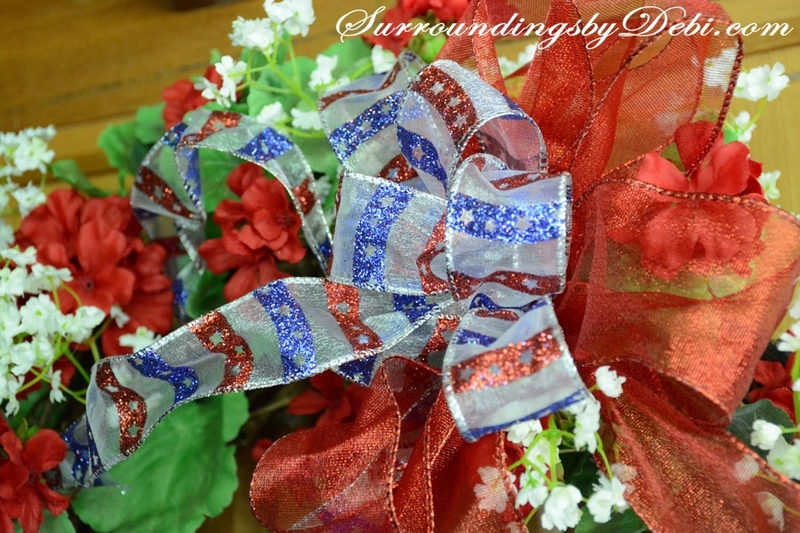 Wanting to add a bit more 4th of July feel to the look, I added a bow to the wreath, using a patriotic ribbon centered into a few loops of red ribbon I had purchased at an after Christmas sale. Both ribbons were wired ribbons and super easy to work with. To tie the whole theme of the front porch together, I added matching ribbons to the top of my topiaries that sit beside my door – working the tails of the ribbons through the ivy of the topiaries. I added a couple of larger flags to the containers of red New Guinea impatiens flanking the steps. 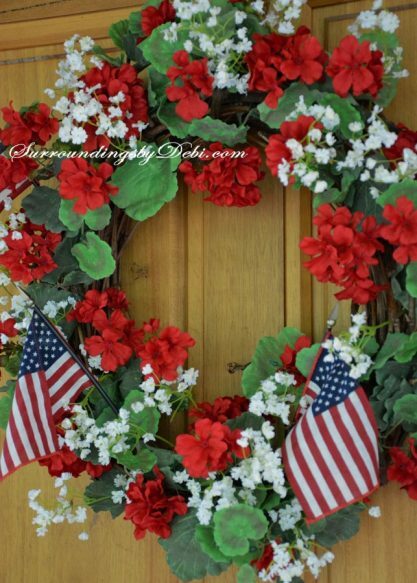 This creates a welcoming 4th of July entrance. 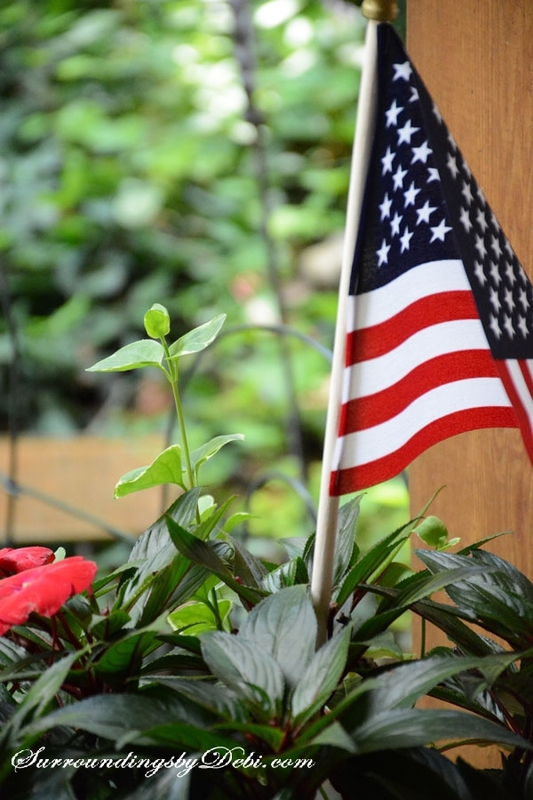 Once the holiday is over, I can simply remove the red, white and blue and I still have a summer look that will last me through the rest of the month. 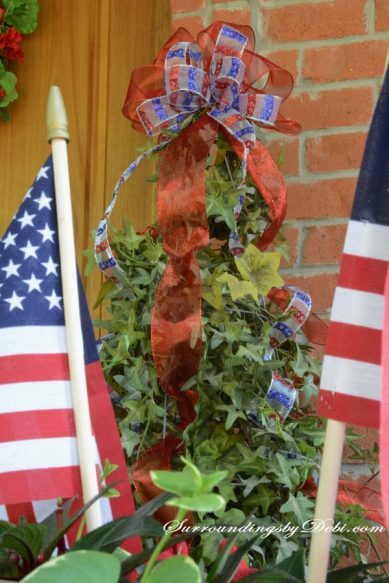 What are your favorite 4th of July holiday decorating ideas? Let’s share! 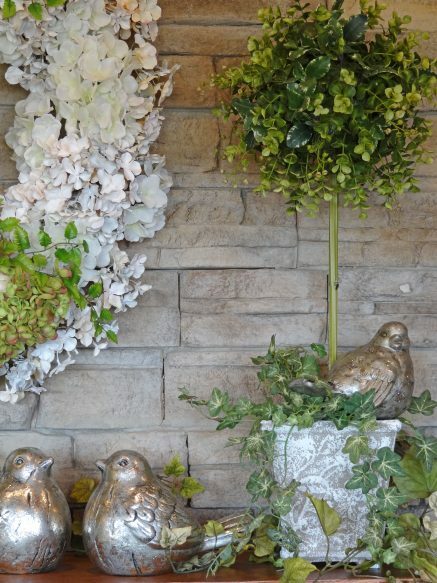 If you like these DIY tutorials, please subscribe to my email or follow me on Facebook. Let’s keep in touch! 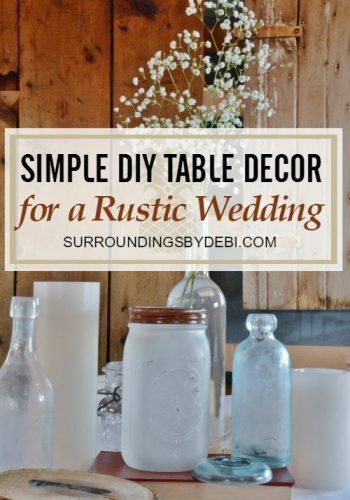 Don’t forget to pin this to your Pinterest board! 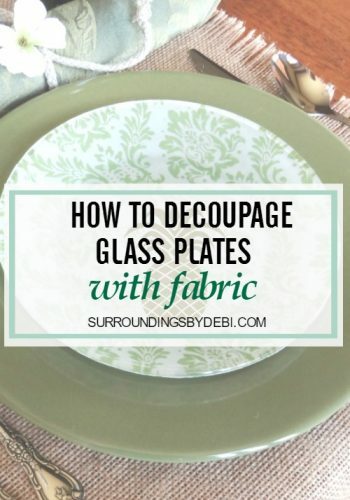 You can find what I am pinning HERE! I was looking at your geranium wreath, just noticed the date of post. 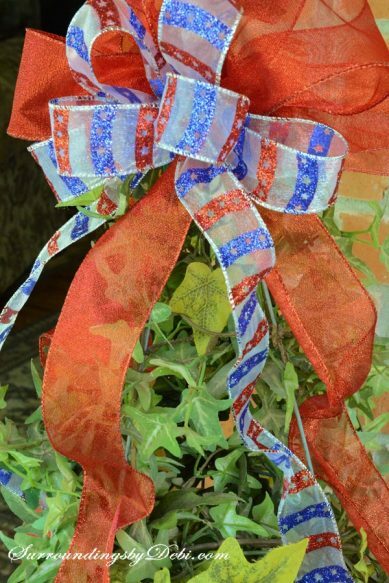 you had mentioned you could make one for someone who mentioned they liked it. Can you still do that? If so how much would you want? Thanks much. Thank you Elizabeth! What a nice compliment! Ok, girl… First of all I love red geraniums. 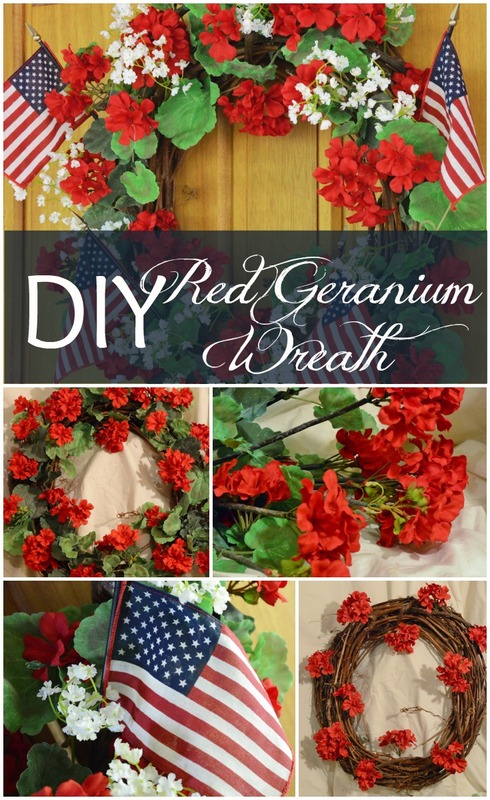 Your geranium wreath is amazing.!! 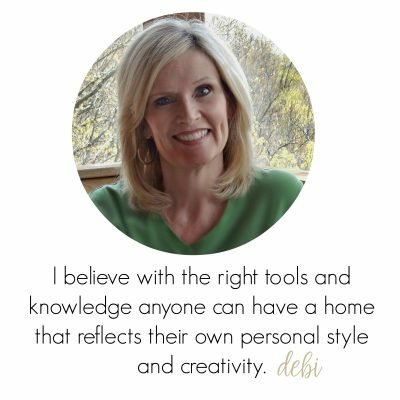 You must move to Dallas soon so you can help me decorate!! You’ve always had the magic touch when it comes to your surroundings, but you keep outdoing yourself. LOVE this one!!! Thank you friend! I appreciate the encouragement! I can make you one if you want me too! It is beautiful! 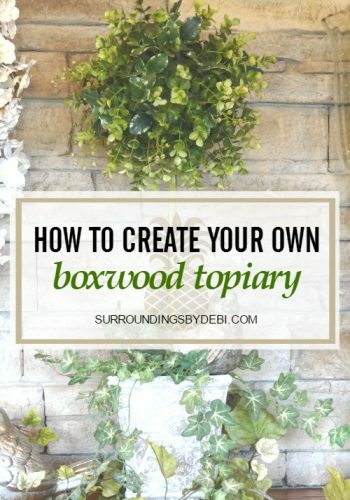 Thanks for the tips about cutting the bush into three different sections. I never would have thought of that. And the tip on using the blow dryer to get rid of the “spider webs”! Can’t wait to make mine! I can’t wait to see yours! 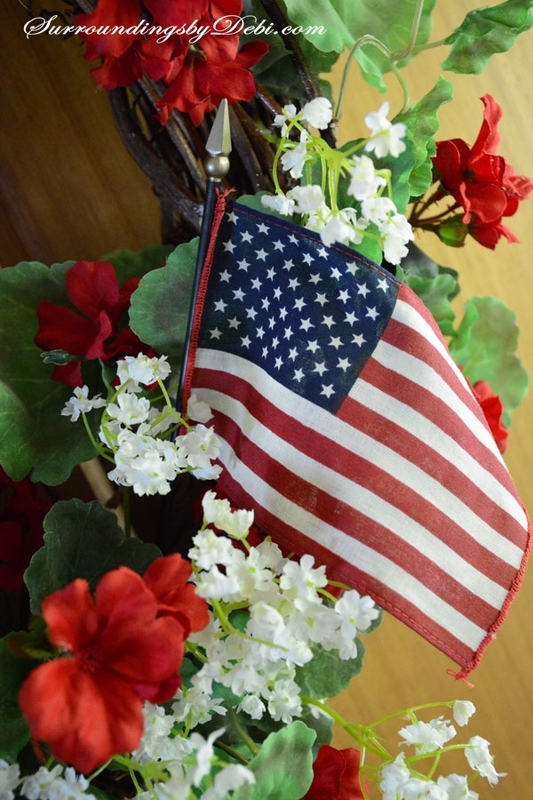 Please share with me if you do. Just popped over to your site! How cute! stop by again sometime! 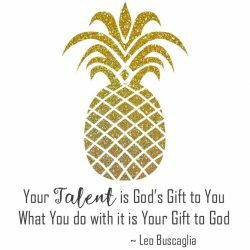 It is very uplifting to see all of your creative skills! Thanks Lucy! 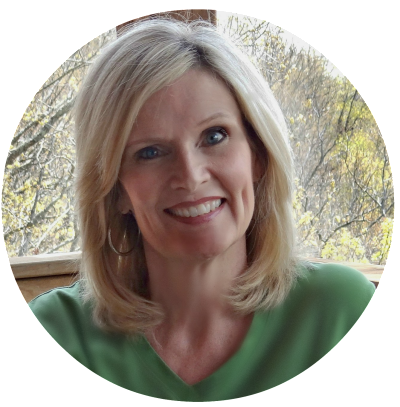 I appreciate your encouragement!